Multi cloud management refers to the use of multiple cloud computing services in a single heterogeneous architecture. The multi cloud environment, enterprises can transfer their workload on multiple clouds, depending on the criticality of data and applications. Moreover, the multi cloud management platform includes dashboards, services, reporting, design, catalog, and marketplace. The global multi cloud management market is expected to expand at a robust CAGR of 32.1% during the forecast period of 2017-2024. 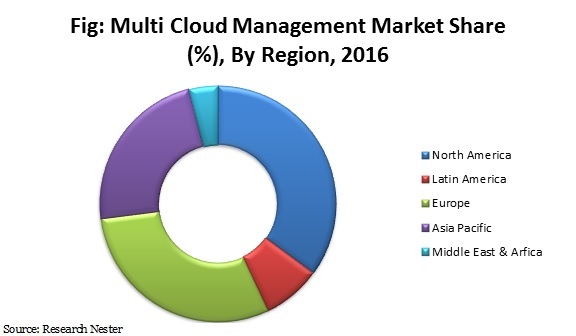 Further, the market of multi cloud management was valued at USD 0.97 Billion in 2016 and is projected to garner USD 7.89 Billion by the end of 2024. Rising demand for multi-cloud management solutions and services among enterprises is anticipated to drive the growth of multi cloud management market. Further, the need for business agility is expected to expand the global multi cloud management market. Globally, North-America is projected to dominate the overall multi cloud management market during the forecast period. Increasing adoption of digital business strategies in the region is expected to positively impact the growth of multi cloud management market. Further, the organizations have invested hugely on advanced technologies to gain a competitive advantage and improve the business operations. Moreover, increasing need for efficient computing framework bodes well for the growth of multi cloud management market in North America. Increasing agility and automation features across the globe is anticipated to intensify the growth of the global multi cloud management market. In addition, increasing technical infrastructure in multi cloud architecture is anticipated to positively drive the growth of the multi cloud management market. Apart from this, rising governance and compliance management is anticipated to be the dynamic factor behind the growth of the multi cloud management market. Factor such as, increasing need to avoid vendor lock-ins is anticipated to supplement the growth of the global multi cloud management market. Further, rising number of multi cloud architecture are likely to further strengthen the growth of the multi cloud management market. In addition, increasing penetration of cloud computing and related technologies, such as internet of things, big data, and server less architecture is predicted to contribute significantly towards the growth of multi cloud management market over the forecast period. However, lack of security and complexities in re-designing the network for cloud are some of the key factors which are expected to limit the growth of global multi cloud management market in upcoming years.